This is a render of the 3D model of the main building of the University of Guanajuato (Universidad de Guanajuato) that I created while I was working there. 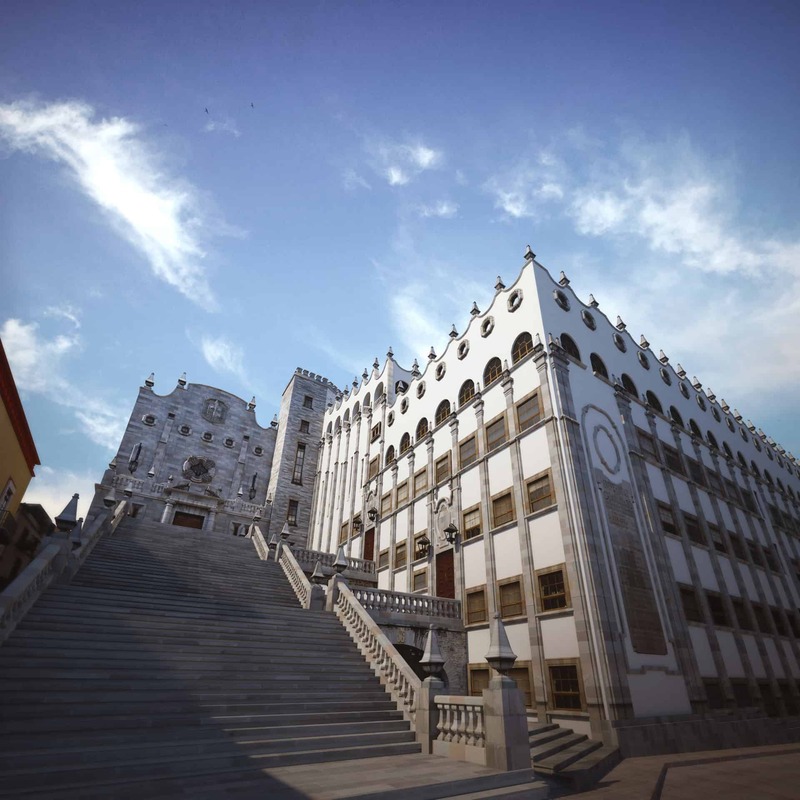 The building is located in the downtown area of the City of Guanajuato in Mexico and is a well known building in Mexico, not only because of its particular architecture influences but because it also appears in the one thousand bill of Mexico’s actual currency. While I was working at the Television, Radio and Multimedia Department of the University of Guanajuato we often needed to create motion graphics using pictures and video of the main building of the institution. At one point we decided to make a 3D model of it in order to have more freedom and control of our use of this iconic building in our in multimedia projects. A first version of the model was created around 2006 by 3D artist and great friend Carlos Ortega. Back the we only needed a low res version of the building because we were working with Standard Definition video (720×480 pixels) so by the time HD and higher resolutions became the norm we needed to upgrade the model. I was in charge of the project and it took me about 2 months to finish the project. First I took photographs of the building for reference and for textures. I use Adobe Photoshop to tweak and prepare the textures for the model. That alone was a considerable amount of work and took more time than I anticipated because I needed the shoot the pics on overcast days or during dawn in order to avoid hard shadows on the surfaces but in some cases it was inevitable and had clean those pictures too. Since I did not have access to blueprints or construction planes of the building I use photographs as references for proportion and overall measurements of the model, so it is not to scale and is needles to say not an accurate representation of reality but again, we only needed the model for motion graphics. I created all the 3D elements using Autodesk 3dsmax. I use parts of the code of arms 3D model of the university that Carlos created and I updated some elements for my version of the building. Some of the near by structures were also modeled in 3dsmax and the rest were created in post from pictures or video sources. Finally I used HDR images for lighting (enviroment lighting) and I also used the Daylight System to create mood variations of the scene. We render out animations in Full HD (1920×1080 pixels) from close ups to full reveals of the model and I think we can even use the scene for 4K projects. I use only built in tools (no plug-ins) for the entire process and originally we did all the render tests using the “mental ray” render engine that by now has been discontinued and replaced with Arnold Renderer. Once the scene was ready, we did some tests and everybody at the office welcomed the hard work and positively commented on the final results. We used the scene for many projects from titles for or TV productions to, animated backgrounds for special events and every time there was a graphic design using a picture of the building we could replace that image with an animation of our 3D model for any multimedia applications of that design. For me, this project taught me a lot of modeling techniques using editable polys and modifiers and also a lot in terms of textures, lighting and rendering. But also, most of the motion graphics that we created using the model taught me that we only need to create or model or render the elements that we needed for each project so that we could optimize our workflow to deliver our projects in time and with the quality levels required for them. 3D modeling is not my area of expertise. I am a video editor, motion graphics designer and digital artist that frequently uses 3D. Don’t be afraid of trying or learning something new, there will always be something to gain in pushing yourself to the unknown. I cut and paste video while I drink coffee and eat cookies. Sometimes I also do Motion Graphics and 3D Modelling.